It was raining at 5am, and I was lost. Again. "Tsukiji wa doko deska?" I asked a passerby. He waved his arm in a circle and pointed behind me. He was saying the entire area behind was the world-famous Tsukiji fish market. But there was no tourist booth, no signage to say go this way or that. I walked down another side street and entered a huge loading dock. Trucks and forklifts were whizzing by in all directions. I kept my head on a swivel, ducked and jumped like Frogger between all the busy machines, and entered a warehouse. A narrow passageway, loaded with crates on all sides, was swarmed with busy fish market workers wearing hard hats and big rubber overalls. More forklifts whizzed by in both directions. I felt like I was entering the booby-trapped temple in Raiders of the Lost Ark, swerving and dancing to avoid getting impaled. I looked into a bay on my left, and there I saw it. 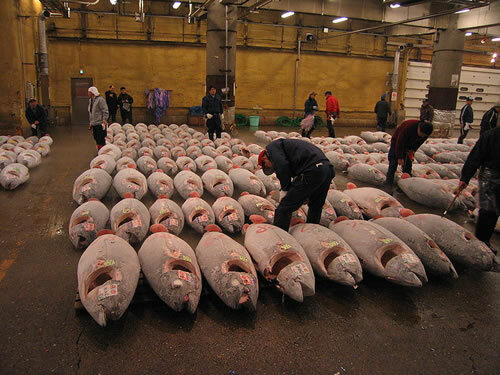 The big bluefin tuna being auctioned off. A large group of Japenese, some in suits, were frantically yelling and raising their arms. 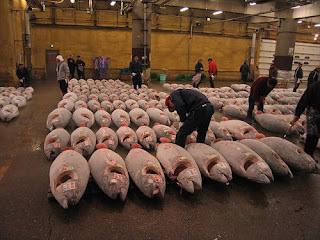 A man hit a bell every once in awhile and one of the huge tuna would get gaff-hooked and dragged off to a forklift. I had never seen tuna so big in my life, and I found out later these were the little guys. All the really big monster tuna were long gone, a victim of capitalism gone wild. With little regulation on the high seas, mind-boggling corporate fishing tankers with nets miles long using helicopter spotters, and deals being brokered between Japan, Norway, and other conspiring parties to hunt them down in every corner of the sea, the bluefin tuna seem to have little chance of surviving extinction. I wandered down to the next bay, but a security official had spotted me and blocked my entrance. I was curious but the official followed me until I had gone further down. Later I met a man who had snuck into one of the guarded bays by jumping in with some Japanese businessmen. Before being kicked out, he said he a saw a large Narwhal carcass laid out across the floor. I couldn't believe it. I knew the Japanese hunted humpback and sperm whales, but I didn't realize they hunted all the other species as well. Mind-blowing. I gave up on the auction bays and wandered into the "outer market", where row upon endless row of styrofoam colors held every manner of living thing in the sea. 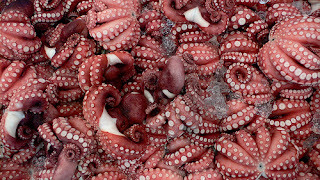 Red octopus, blue octopus, squids of all different shapes, flying fish, sea cucumbers, oysters, scallops still squirting, cuddlefish laying in pools of their own ink, everything slimy and fresh and awesome. It was a seafood lover's buffet of delights. I wandered past a team of men hauling one of the huge tuna onto a table. They picked up a huge 2-handled sword, a man on each end, and a 3rd holding down the fish. The men took the 6-foot sword and sliced the fish into two halves. Then the sliced into again into quarters. 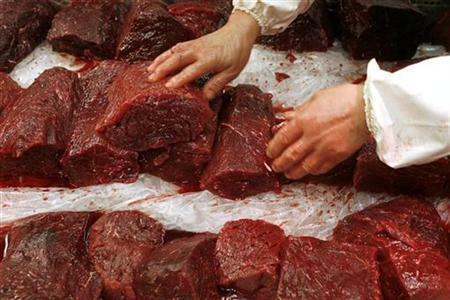 Then then each took a piece and preceded to cut huge steaks and dump them into another cooler. My mouth watered, even though I knew I was looking at something that wasn't sustainable. At another stall a team of men hoisted up another large tuna that had been flash frozen. They started up a band saw and slid the fish in, like a plank of wood. BzzzZzzzzzz!! The fish was sawed in half in a few seconds. They went back and sawed it into more pieces. I wandered around, like Captain Nemo aboard the Nautilus, in awe at the bounty of the oceans before me. After getting my fill, I wandered out a different exit back to the main street, again dodging the trucks running every direction. I looked back and noticed a large sign in English. "No Foreigners Allowed!" Ummm..... whoops. no foreigners? Tsukiji is listed in all the guide books. Maybe the whale section is off limits.